Fort Collins Home w/ Hot Tub - 5 Min to Old Town! Find all the best of Fort Collins minutes from your front door while staying at this 2-bedroom, 1-bath bungalow. ‘Remington Retreat’ is a recently renovated vacation rental with room for 6, a beautifully landscaped yard and WiFi-enabled hot tub. Tour Colorado State University a short stroll away, discover the wonders of Old Town 5 minutes up the road or dive into the scenic outdoor oasis of Horsetooth Reservoir 7 miles west! Peace, quiet and adventure abound in this fantastic FoCo location. Decompress from daily exploits in the backyard, offering a charcoal grill and furnished patio. Connect your Smartphone to the hot tub as you sink in for some R&R. When you’re feeling hungry, walk no more than a couple of blocks to feast at local favorites like Totally 80’s Pizza and Black Bottle Brewery, or stay in and enjoy a quick bite prepared by the wet bar. Head into Old Town for a night out, or opt for an at-home evening in the well-appointed living area, fully furnished with a gas fireplace and mounted flat-screen cable TV. Call it a night and retire to either one of the 2 bedrooms, each outfitted with brand new bedding and medium-soft memory foam mattresses. Early risers staying in the master bedroom will love starting their mornings on the walk-out patio! 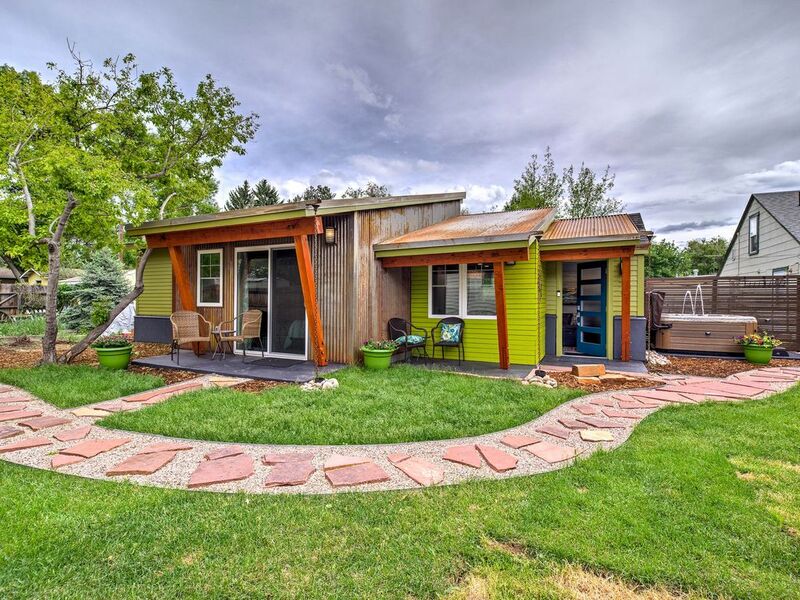 Whether you’re in town to visit your student at CSU, hike around Horsetooth Reservoir or discover the magic of Old Town - this centrally located bungalow serves as your one-stop-shop for Fort Collins fun! Explore local eateries only a short walk away, or stroll a mile toward the Sonny Lubick Field to begin your tour of the sprawling Colorado State University campus. When you need a change of scenery, Old Town offers entertainment for all with historic sites, novelty shops, cozy cafes and 5-star restaurants. Build your own cheese board at The Welsh Rabbit, treat your group to creative tapas and cocktails at Cafe Vino, or experience the brand new Elizabeth Hotel - home to the one-of-a-kind Emporium Kitchen & Wine Market. For outdoor adventures, drive 15 minutes toward Horsetooth Reservoir providing opportunities for paddle boarding, swimming, fishing and boating, along with hiking, horseback riding and mountain biking! Thank you for allowing us to use your home. It was perfect for our visit to see our college daughter. We will be back again soon! Awesome location, Excellent accommodations and Exceptional Host (Mr Bill)! This place leaves you wanting for nothing. My husband and I spent part of a long weekend in this lovely guest house. It is clean, beautifully decorated and thoughtfully arranged. The location is perfect and all the little extras were very much appreciated. We look forward to staying again soon. My wife and I were in Ft. Collins for five days, visiting our daughter; the owner was very welcoming and informative and the place was new, clean, comfortable and perfectly located with nice touches. Two bedrooms, one bath and a "mini kitchen". Would definitely recommend! Remington Retreat was an incredible stay! Comfy, convenient and an amazing home away from home. Definitely recommend this beautiful place. And an incredibly welcoming host. The home is a guest house on the owners property. Its a very well done home with a huge master king bedroom that looks out into the yard with its own walk-out patio. The guest bedroom is large as well with a queen size mattress. Pocket doors make the space feel more open. There is a a little kitchenette in the living room with a sink, small fridge/freezer, keurig, tea pot and toaster oven. It was perfect for everything except when we needed to reheat soup. The home was very clean and modern. The hot tub was a great touch and amazing to have available after spending the evening dancing at the Mishawaka Ampitheater. We will definitely come back!